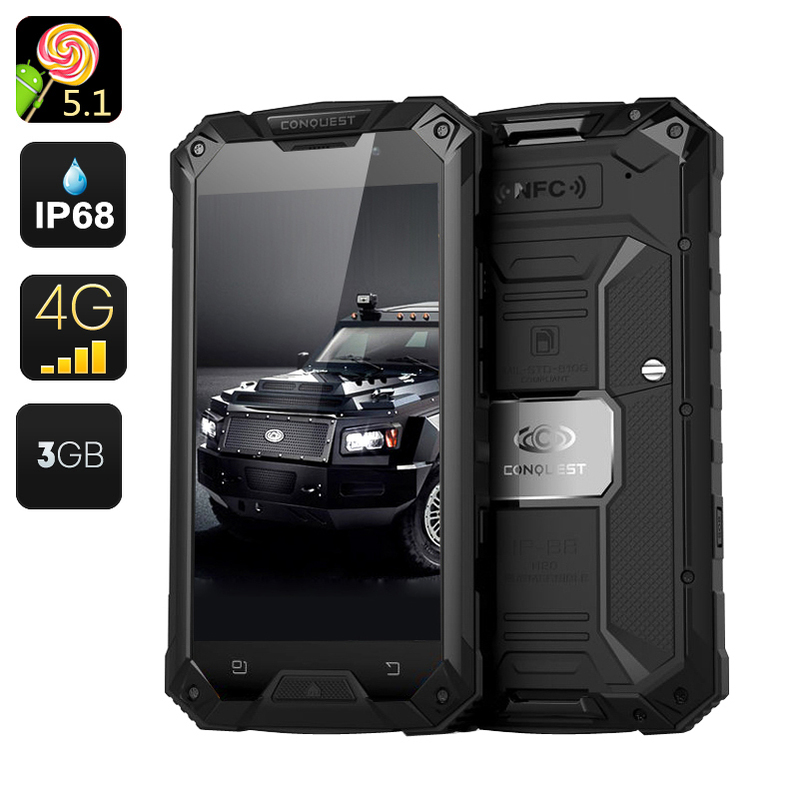 Successfully Added Conquest S6 Pro Rugged Smartphone - MTK8752 Octa Core CPU, 3GB RAM, 4G, IP68, 5 Inch HD Screen, Android 5.1, 32GB Memory (Black) to your Shopping Cart. This S6 Pro is the 3rd generation of this rugged model from Conquest, their attention to detail has resulted in a stylish rugged phone that not only looks stunning but combines excellent specifications with a tried and tested level of protection to keep it functioning in all conditions. With a toughened shockproof protection the Conquest S6 Pro is similar to the off road vehicle from which it gets it name. This Smartphone offers an impressive level of ingress protection coming with an IP68 rating and just like the luxury off road vehicle this Smartphone’s unique blend of luxury and ruggedness make it an appealing choice for connoisseurs of exquisite design and reliable performance. Its waterproof, dust proof and shock proof so it will keep working in any of the tough conditions that you could find yourself in. Running an MTK8752 Octa Core CPU clocked at 1.7GHZ and with 3GB of RAM the Conquest S6 Pro is sure to impress with its thunderous performance leaving all competitors in its wake as it blitzes through any tasks set before it. The impressively bright 5 inch touch screen display has a 720p resolution that will bring all your media to life. 4G Connectivity support for 2 SIM cards will not only bring you the fastest cellular data speeds around but also allow you to manage multiple numbers form the same phone, so you can avoid roaming charges when on holidays and business trips or manage business and personal contacts more efficiently from this one device. With a 13Mp rear camera and 5 MP front shooter the Conquest S6 Plus has one of the best cameras among rugged smartphones, this will allow you to capture fantastic photos and even take videos at a resolution of 1920x1080, perfect to capture the most memorable moments from your outdoor adventures. The Conquest S6 Pro comes with a 12 months warranty, brought to you by the leader in electronic devices as well as wholesale rugged smart phones..